As I have been working on my fall course which focuses on collaboration and the instructional role of the school librarian I have been reading a great deal of articles on this topic and one that popped up in my ScoopIt headlines about a month ago drew my interest. It was this post on Forbes called the 12 Habits of Highly Collaborative Organizations. While speaking from the business point of view I saw the parallels in these elements that could certainly be applied to school librarians. Additionally I like that it is from a leadership perspective and how we can get others to buy into collaboration. 1. Focusing on who benefits from the collaboration. I believe this is key when getting teachers to buy into collaboration – you have to stay focused on how their students will benefit from collaborating with you. 2. Strategy before technology. This is something we are all familiar with – the hottest newest technology being purchased with out any planning for implementation and use. In the area of collaboration there is a wealth of new tools out there that can be used by school librarians, teachers, and students – but have a plan how will you use these tools, how will you teach teachers to use these tools and how can they be implemented and utilized in instruction to include students in collaborations. 3. Learn to get out of the way. Don’t stifle collaboration by enforcing too many rules and policies. Be open to spontaneous collaboration opportunities! The last thing a teacher wants to hear is oh yes we can work together on something but I’m going to need you to fill out this form and give me three days notice. Being flexible and fluid are characteristics of any good school librarian – collaboration opportunities may pop up at times you never expect them! 4. Listen to others! Educating children is a group effort and as the school librarian we are an important part of this process, but it is important to always remember that you are just a part – always listen to others and their ideas, suggestions, and feedback then integrate this into your planning and program. 5. Lead by example. As Empowering Learners (AASL, 2009) states school librarians should be leaders. Again I think by modeling good collaborative practices with other school librarians, administrators, and teachers we can help create a collaborative culture in our schools. 6. Integrate the flow of work. Teachers have a great deal on their plates and the last thing they want is “one more thing” they have to do. Make collaboration an integrated part of their curriculum and what they are already responsible for teaching. Show them that collaborating with you is not one more thing, but can help to ease their burden. 7. Create a supportive environment. Is your library a supportive environment for collaboration? Is it welcoming for teachers and are you approachable? Do you provide training for teachers to support them in their efforts with instruction? Do you provide an environment that encourages the use of new technologies for collaboration? Think about what sort of support and environment for learning that you provide as you start off this new school year. 8. Measure what matters. There are many things you can evaluate and measure about your school library program, but are you looking at what matters? Collaborative experiences and how they impact student learning is what matters – not how many books were checked out or how many AR tests were taken. Are you measuring what matters? 9. Persistence! I tell my students that collaboration is an every day effort. It is not something that is going to come easily and does require work and building relationships with teachers. You will not experience success every time and you will not get every teacher to work with you, but you cannot be discouraged – you must be persistent and keep on reaching out to teachers. 10. Adapt and evolve. No two words are truer than these two words in describing school librarians. We have to adapt and evolve as the needs of our students change and as our profession as a whole evolves to stay current and relevant. Also in collaborating, adapt to what works for the teachers in your schools and evolve to utilize the new collaboration tools. Stay up to date and current what is going on in the profession and the world of education – this will allow you to anticipate change and evolve too. 11. Collaboration benefits the user. In our case collaboration should benefit our students. We all have different skills and areas of expertise – when we collaborate we can give our students the best of what each person has to offer. Also we can collaborate with others outside of our buildings to bring in experts in all areas and it has become increasingly easier with technologies such as Sykpe and Google Hangout to bring experts from all over the world into our classrooms. Think bout collaborating on a larger scale – what experts can you tap to provide authentic learning experiences for your students? 12. Collaboration makes the world a better place! Collaboration is an essential element of the school librarian’s world and will most definitely make a difference in how you are able to do your job. It also makes life easier for teachers, they may not know it yet, but as soon as you show them they will see how collaborating to design instruction and co-teach required standards can make things better for them and their students. And finally it is all about the students and their success and they can only benefit from collaboration – whether it is between school librarians and teachers, school librarians and other school librarians, or even with experts from around the world. As you forge through into this new school year think abut these 12 habits and question yourself and your own practices. Just writing this blog post made me think about my own practices and maybe how I am not doing all I can to create a highly collaborative learning environment for my own students and I have already begun brainstorming ideas on ways to work on this. American Association of School Librarians. (2009). Empowering Learners: Guidelines for school library media programs. Chicago, IL: AASL. I love mathematics. I’m not sure how many librarians would agree with me, and I often notice that we overlook math teachers in our collaboration efforts. I was surprised one year when my principal asked me, as the school librarian, to focus my efforts on third grade math. She also provided me with the suggestion that I send a word problem to the class ahead of their visit to the library to generate curiosity about what we would be doing in the library. Our school had a mathematics focus that year for professional development and I attended with the teachers. At one of those sessions, the facilitator suggested that students write their own word problems and he offered this familiar framework from language arts: character, setting, problem. The proverbial lightbulb went off for me – here was my hook. I could take the characters and setting from a picture book and write a math word problem that related somehow to the problem in the book. I wrote the word problem on chart paper and sent it to the classroom ahead of their library visit. Students brought their work to the library and I opened the lesson with a discussion about strategies to solve the problem. “I don’t want to know the answer, I want to talk about how you got the answer.” The discussions and activities that followed exemplified much of the second of the Standards for the 21st-Century Learner: 2.1.2 Organize knowledge so that it is useful; 2.2.2 Use both divergent and convergent thinking to formulate alternative conclusions and test them against the evidence; 2.3.1 Connect understanding to the real world; and 2.4.2 Reflect on systematic process and assess for completeness of investigation. I was often surprised when I asked students to explain their work by the kinds of divergent thinking that emerged. Often students surprised me with valid methods that I had not thought about. I learned from them, and mathematics became an exciting and collaborative area of exploration for all of us. AASL has a crosswalk with the Common Core mathematics standards and the Standards for the 21st Century Learner. I would argue that anywhere in the Common Core standards where you see “real world,” there’s a place for the librarian to build a connection with the mathematics in the classroom and the kinds of real world problems encountered in both fiction and informational texts. Check out the article: Ireland, Ryan (2013). Get graphic with stats. VOYA 36 (3) 38-9. Helping individual teachers and students locate resources. Participating in collaborative planning that focuses on accessing, evaluating, and applying information. Leading professional development for staff and educators (AASL). The infographic goes on to share some of the ways schools librarians practice continuous learning in order to improve their leadership abilities. School librarians might consider linking this document to the library homepage or posting it on the library bulletin board or in school library office if colleagues will see it there. This infographic could also be a very fine welcome back to school gift for administrators who may need to be reminded of the central role school librarians can play in helping build a collective capacity for collaboration. American Association of School Librarians. “Working Together Is Working Smarter.” ALA.org. N.p., n.d. Web. 6 Aug. 2013. <http://tinyurl.com/aaslncleinfographic>. All over the nation students and educators are returning to school. 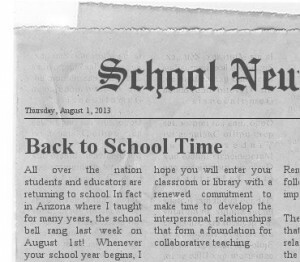 In fact in Arizona where I taught for many years, the school bell rang last week on August 1st! Whenever your school year begins, I hope you will enter your classroom or library with a renewed commitment to make time to develop the interpersonal relationships that form a foundation for collaborative teaching. Since that time, I have spent the majority of my preK-12 teaching career in school libraries. From my very first library position at Elvira Elementary, I realized how the attitudes, values, and priorities of our principal, teaching colleagues, and staff affected teaching and learning in our school. And the parents who walked their children to school and hugged them so long at the gate and the bus drivers who gave bus riders their first school smiles of the day, all had a role in making our school a nurturing environment in which to learn and teach.